PowerPoint 2013 is the world’s premier presentation software that allows the creation of highly customized professional presentations. This training course in PowerPoint 2013 essentials provides beginners an understanding and development of skills in the basic functions of the software. This highly valuable and practical training course is now available throughout Hong Kong, including Central and also via instructor-led online training. This Microsoft PowerPoint 2013 Essentials training course can be delivered at your premises by one of our expert local or international trainers or live online using our HIVE technology. This extensive training course helps participants develop basic skills in PowerPoint 2013, so that they use it effortlessly to complete tasks. 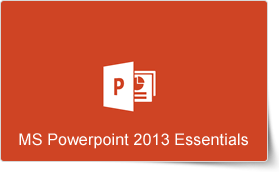 PowerPoint 2013 helps create and launch documents easily. This newest version of PowerPoint has an improved Presentation View with gives your presentations that extra focus. It also comes with an improved user interface with a variety of powerful tools to help you share your presentations through Skydrive. During the course, participants learn to use the standard features of PowerPoint 2013 including creating presentations from templates, creating presentations without templates, adding slides, inserting text, editing and formatting text, inserting and altering images, using transitions and animation, and preparing narration.